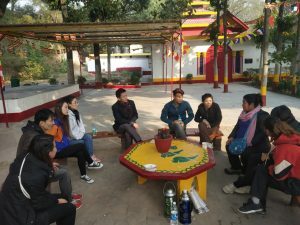 As per the 16th Tibetan Parliament-in-exile’s Tibetan settlements visitation/assessment program, Parliamentarian Tenzin Jamyang visited Tibetan communities, Tibetan Sweater seller Markets and colleges in Chandigarh, Mohali, Ambala, Patiala, Ludhiana and Jalandhar from 15 January to 25 January, 2019. He started his assessment/visitation program from Chandigarh, by visiting Tibetan sweater sellers, listening to their grievances and addressing the Tibetan sweater sellers on four major topics, regarding His Holiness the Dalai Lama’s accomplishments and his commitments, the current critical situation inside Tibet, international political reactions to Tibet issue and regarding the proceedings of 16th Tibetan Parliament-in-Exile. He had meetings with Tibetan college students, Assistant of Vice Chancellor of Punjab University and social worker Tsering Dolkar. He also met M.C.D. 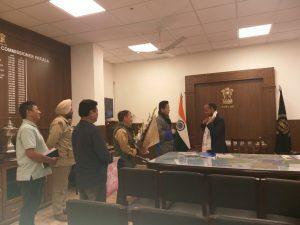 Commissioner Mr. Kama Kishor Yadav, IAS Officer and thanked him on behalf of Tibetan people, especially Tibetans residing in Chandigarh for his essential help and support. Continuing his visitation/assessment program from Mohali, he visited Tibetan sweater sellers and addressed them on the above-mentioned topics, listened to the grievances and clarified their doubts. After that he visited Tibetan sweater seller of Ambala, had a meeting with the Tibetan community. He also met Mr. Anil Vij, Haryana State Health, Youth and Sports Minister. He visited Tibetan sweater sellers of Patiala and listened to their grievances. He also met DC Mr. Kumar Amit, IAS and staff of F.R.O. Office. Next day, he met some lalas(business mans), had discussions and exchanged ideas with them at Ludhiana He further continued his visitation/assessment program in Jalandhar. He met Mr. Aman Mittal, associate director of Lovely Professional University and Tibetans studying there. He also visited Tibetan sweater sellers and had meeting with them.